The issue of considering appointment on compassionate grounds(CG) to sons/daughters, born through other than first legally married wife has been engaging the attention of this Ministry for quite some time, in the backdrop of partial quashing of CG related instructions contained in this Ministry's letter dated 02.01.1992 regarding such appointments, by the Hon'ble High Court/Calcutta in the case (WPCT 20 of 2009) Namita Goldar & Ors. Vs UOI & Others. “it is now well settled that appointment on compassionate grounds is not a source of recruitment. On the other hand it is an exception to the general rule that recruitment to public services should be on the basis of merit, by an open invitation providing equal opportunity to all eligible persons to participate in the selection process. The dependants of employees, who die in harness, do not have any special claim or right to employment, except by way of the concession that may be extended by the employer under the Rules or by a separate scheme, to enable the family of the deceased to get over the sudden financial crisis. The claim for compassionate appointment is, therefore, traceable only to the scheme framed by the employer for such employment and there is no right whatsoever out side such scheme....."
4. The matter has been examined and in supersession of this Ministry's letter dated 02.01.1992 issued under RBE No. 01/1992 and No. E(NG)II/2012/RC-1/21 dated 03.04.2013, it has been decided that the first right of being considered for compassionate grounds appointment is vested, in cases of death of Railway servants while in service, with the legally wedded surviving widow provided she has not remarried at the time of making request for appointments on compassionate grounds. 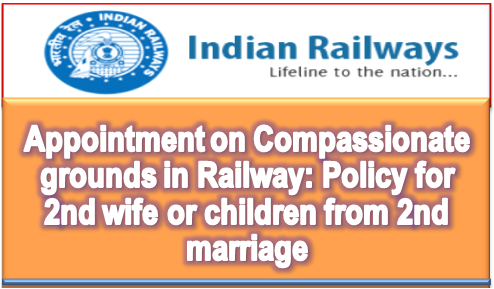 It is clarified that in cases of those Railway Servants who are governed by the Hindu Marriage Act, 1955, there can only be one legally wedded wife/widow, as second marriage, while spouse is living, is void/voidable in view of the Section 5(1) read with Section 11 of the Act. In this respect, Railway Board's letter No. E(D&A)92 GS 1-1 dated 10.04.1992 connects. (a) In cases of those Railway Servants who are governed by the Hindu Marriage Act, 1955 : Son (including adopted son); or daughter(including widowed/ adopted/married/divorced daughter). However, if such Railway Servant has left sons/daughters, who have been treated as legitimate or deemed to be legitimate, under Section 16 of Hindu Marriage Act, 1955, neither widow can nominate them as bread winner for CG appointment nor such sons/daughters can claim CG appointment.